COULD you, yourself, answer these questions? If someone asked you to open your Bible and show him exactly where the Bible says salvation means going to heaven - could you do it? 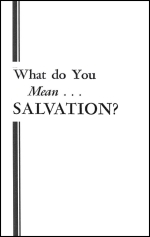 Is salvation a place, a destination, a condition, a reward, - or WHAT? ... and where would you turn in your Bible to find it? Are you sure? Could you open your Bible and show a questioner where it tells you when you receive salvation? Do you actually get it now, when you die, when Christ returns - or at some other time? This booklet will show you plainly. Are you, at conversion, an inheritor, an heir to inherit, or what - and just what does one inherit? Suppose you were asked what connection there is between salvation and that whole third, of the Bible devoted to prophecy. Could you explain it? Another third or more of the Bible is taken up with history. Can you explain the connection of this vast amount of Scripture with salvation? Can you believe MOST of the Bible is totally unconcerned with the matter of salvation?